What Is the Difference Between Puff Pastry & Crescent Rolls? The buttermilk in homemade biscuits helps them rise. 2 Do You Have to Bake Your Biscuit Dough Immediately? 3 What Is the Difference Between Puff Pastry & Crescent Rolls? The secret to soft, flaky Southern-style biscuits is cold ingredients, minimal handling and a hot oven. 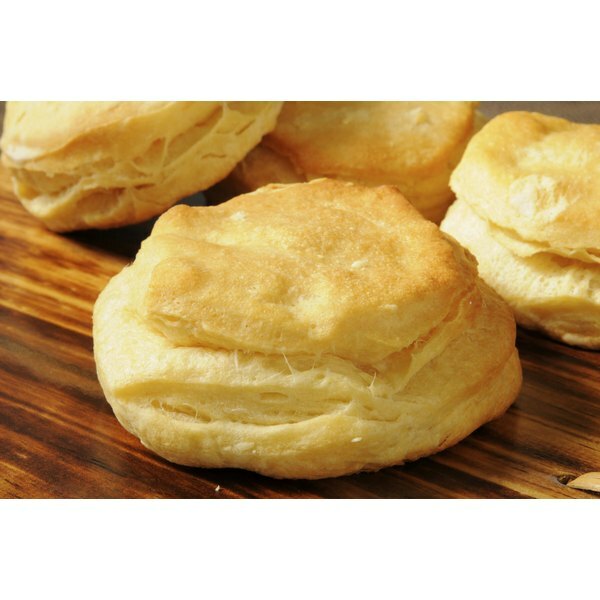 Much like a pie crust, the flakiness of biscuits comes from cold butter. While you can substitute shortening for the butter, the resulting texture will be more cakelike and less layered. This preparation is adapted from a recipe created by Southern Living. Put the stick of butter in the freezer 15 minutes before assembling the remaining ingredients. Add all the dry ingredients to a medium-size glass or metal bowl and mix well. Take the butter out of the freezer, unwrap it and grate it with a box grater, using the large holes. Gently stir the butter into the flour mixture so it's evenly incorporated. Make a well in the center of the flour mixture and pour in the buttermilk. Stir until the mixture forms a shaggy dough that pulls away from the sides of the bowl. Dust a marble cutting board or your countertop with flour and turn the dough out of the bowl onto the floured surface. Use a rolling pin dusted with flour to shape the dough into a 1/2-inch-thick rectangle. Fold the rectangle in half, bringing the short ends together. Rotate the dough a quarter turn, roll into a new rectangle and fold in half again. Repeat the step 2 more times. After the last fold, roll the dough out so it's about 3/4 inch thick. Work as quickly as possible so the dough doesn't warm up too much. Cut the biscuit dough into rounds with a biscuit or cookie cutter, or even a drinking glass. The size of the cutter will determine how many biscuits you end up with. Dip the cutter in flour and push it straight down into the dough without twisting. Place the cut biscuits, once loose from the rectangle, so that they're touching on a baking sheet lined with parchment paper. Using a metal spatula, rather than your hands, to transfer the biscuits to the baking sheet helps them retain their shape and stay cold. Beat the egg with the milk in a small bowl. Coat the top of each biscuit with some of egg mixture using a pastry brush. Bake for 12 to 15 minutes until the tops are golden and firm to the touch. What if I Don't Have Buttermilk? Make your own version of buttermilk by combining milk with an acid, such as vinegar or lemon juice. The acid will curdle the milk, and it's hard to tell the difference when you use it for biscuits. Keep the buttermilk in the refrigerator until you're ready to use it to keep it cold. If you use self-rising flour, omit the baking powder, salt and baking soda. The egg wash will result in biscuits with shiny, browned tops, but you can customize the wash you use depending on the effect you want. Using only milk results in browning, and the egg yolk produces lots of shine. There's plenty of cheese in Southern cuisine, so adding up to 3/4 cup of grated cheese, such as cheddar or Parmesan, won't make your biscuits less authentic. For herb biscuits, add 2 tablespoons of fresh chopped herbs or 2 teaspoons of dried herbs to the dry ingredients. Parsley, chives, sage and thyme all offer interest. Sweeten things up with 3 tablespoons of sugar added to the dry ingredients for biscuits fit to be served with dessert. Can You Make Flour Tortillas Without Using Lard? Does Filet Mignon Freeze Well?